Sampled Orchestration in a Weekend will show you how to create realistic, uplifting and impressive music from sampled instruments. Whether you are working in Logic, Cubase or any other DAW, this course will unlock the techniques used by top working composers and song-writers. Join award-winning film and games composer Guy Michelmore as he explains how to use the cutting edge technologies available to every composer and songwriter, to bring your music to life. Join award winning composer Guy Michelmore as he walks you through the whole process of composing a piece in his studio through to the live orchestral session. It shows you the process used by professional film and games composers the world over, step by step. Starting work first thing in the morning, the demo is written and recorded by the afternoon. Then we walk through score prep, tidying up the midi and audio. Now off to LA to meet the orchestrator and finally onto the legendary Warner Bros scoring stage to record the finished track. Composer Blueprint Training is your shortcut to scoring many of the most in demand styles and genres. Watch over the shoulder as award winning composer Guy Michelmore writes cues in these key styles: Action, Comedy, Emotive, Ethnic, Heroic, Fantasy, Suspense, Contemporary Hybrid Action, ‘Moody’ Drama. Guy lets you in on the secrets many working professional composers use to nail these common styles. 6 hours of video plus comprehensive course text. Swipe the ideas and get up and running quickly or use them as a jumping off point to find your own voice. Music For The Media: Volume 1 is all about making a living writing music people want to buy. The course prepares you for some of the most dynamic areas of the industry including trailers and games, production music and television themes. You will be learning to step outside your comfort zone and write music to a specific client brief, something most first time media composers find extremely difficult. This is the fundamental skill that is the bedrock on which careers are built. In this course, award winning composers show you how it’s done, revealing the secrets of their craft and passing on inside knowledge and invaluable tips that can turbo charge your career. Music For The Media: Volume Two is an intensive course in film scoring that covers both the technical and creative aspects of writing film soundtracks, scoring TV shows and much more. Written and presented by award winning composers, the course takes you from spotting and synching your music to picture, through to composing for feature films and delivering. Building on the core skills established in Music for the Media: Volume One, this course will help you develop your career as a film or TV composer. 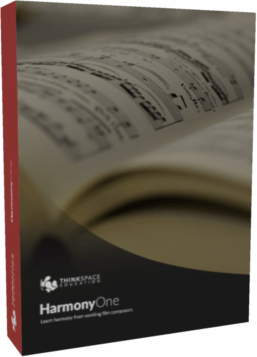 Well-written harmony can transform your music. This online course will give you the core skills and techniques to get started writing successful four-part harmony. Unlike most music theory courses, it is firmly based in the real-world and is presented with our trademark practical, no-nonsense style. You will learn harmony from working film composers and orchestrators. It’s a practical, inspiring online music course that delivers four-part harmony on a need-to-know basis. There’s nothing you’ll learn that you can’t use to improve your music right now. Hours of video tutorials, detailed supporting text with loads of examples, this course will bring this subject to life and turbo charge your composition. Give a lift to your music with advanced harmonic techniques from modal harmony to counterpoint. Go beyond major key harmony and learn to work in minor keys, use of extended chromatic chords, augmented 6ths, 11ths and 13ths to increase the range of tonal colours in your music. Learn about modulation, secondary dominants, accented passing notes, suspensions and anticipations to give personality to your compositions. 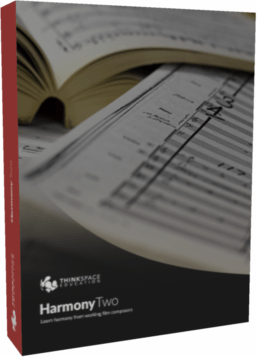 If you have a grounding in basic four-part harmony, this course will help bring clarity to your music and help you produce complex arrangements more quickly and effectively. Is a your DAW template holding you back? This course is the pain-free way learn to set up a professional orchestral template. Join award winning film composer Guy Michelmore for 11 hours of video tutorials covering both Cubase and Logic X, plus comprehensive course text. Planning, routing, choosing the right libraries, making best use of your computer’s memory and CPU , organising big templates, working with slaves and much more. Bring a professional polish to your music with award winning film mixer Jake Jackson. Jake shows you how to mix orchestral music, taking you step by step through both a sampled and a live orchestral mix at the legendary Air Studios. Panning, routing, EQ, reverbs, digital audio polishing and so much more. Download the complete multitrack recordings to load into your DAW at home. We give you four complete cues, two sampled and two recorded with a live 80 piece orchestra. Is a dated musical style stopping you from fulfilling your potential? Bring your music bang up to date with these essential contemporary techniques. Learn to create the cool effects you hear every day in games, films, trailers and TV. Reverses, drones, rhythmic pulses, digital audio manipulation, synth programming 101 and much more. Join top trailer composers and EDM artist Konstantine Pope. Techniques that work with any DAW. This course has transformed the careers of many composers. Learn to produce the cutting-edge sound of today’s games and movies with trailer composer Konstantine Pope. Working with digital audio and synths like Razor, Serum and Massive, creating braams, risers, complex multi-layered sound design, advanced pulses and drones, comb-filtering , essential drum programming and more. Don’t let your sound get left behind. Stay current with Sound Design Professional. Essential technical skills for anyone hoping to get started in game music or audio. Learn to implement sound design or music interactively using industry standard middleware FMOD. Learn from top games sound designer Andy Gibson. Everything you need to get up and running quickly. The course covers the FMOD interface, events, banks, assets, randomising loops, transitions, snapshots and a lot more. A step-by-step, structured course that quickly and effectively opens the door to the world of game audio. FMOD in a Weekend from ThinkSpace Education on Vimeo.